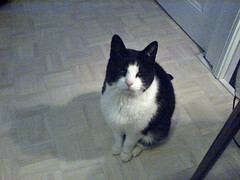 After another hearty breakfast and a visit from my feline friend it's time to bid Amsterdam farewell. Sjaack calls a taxi for me, not before reminding me there's a station nearby and that taxis are very expensive. Yeah, tell me about it, I felt like saying - the taxis are still better than braving the metro, especially since they are devoid of escalators (something that comes in handy when you have heavy bags). Sjaack, who has family in Australia, in fact in the Dandenongs here in Melbourne. He very nicely praises Melbourne and says he loves the city and loves Flinders Street station and that it reminds him of Amsterdam Central. Flinders Street Station is very nice but it's fades in comparison to Amsterdam's station - architecturally speaking and size wise. The taxi arrives and there's a bit of a chat and a laugh between the driver and Sjaack - I hope he's saying don't rip this tourist off. Whatever it is, only €3.20 gets put on the meter and we actually seem to be going the correct way to the station. The fare ends up costing €12.60 - a marked improvement. Asking at the information desk I find out that the train leaves from platform 7b - what she doesn't know is if I need a reservation so she directs me to internation sales on platform 1a. Heading up there I find a queue that would probably end up my remaing time - so I decide to chance it and go unreserved. I can, if I have to, get the reservation onboard. 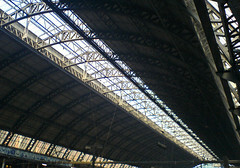 The platforms are encased in a huge hanger like structure - very light and airy. With German precision, the train leaves 3 minutes late! Must be that election result that has thrown everything out of whack. 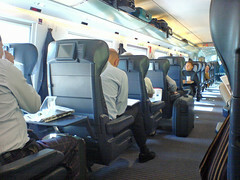 I'm on an ICE train - 1st class are the first two carriages of the train - I'm in the first carriage, where you can actually see through to the drivers area. In fact, people go up there and visit with the driver. There's also an "entertainment" system, tv's on the seats in front showing 2 channels (both in german) and 3 radio stations (each station plays a different cd). Trolleys come through offering food and drink but I'm being fresh aired by them. After the 3rd time through I finally get their attention and a drink - at €2.70 for a bottle for water I shouldn't have bothered...it's makes the €1 bottle on the brussels to amsterdam line a bargain. 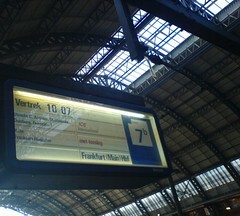 The trip takes a little over 2 and a half hours and I arrive in Köln (Cologne) around 12:45.